Lock in a great price for Hotel Goliath am Dom – rated 9 by recent guests! Very modern hotel in an old historic building - a unique mix of decor done very well. Room was spacious, modern and extremely clean. We were on the top (6th) floor, which had a lovely and quiet roof terrace. 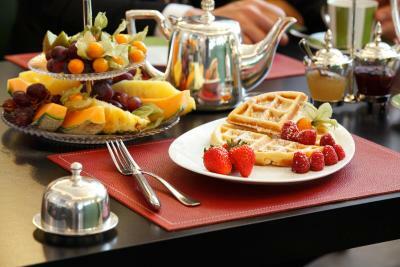 An excellent breakfast was included, and they also cook eggs to order in addition to the wide selections on the buffet. 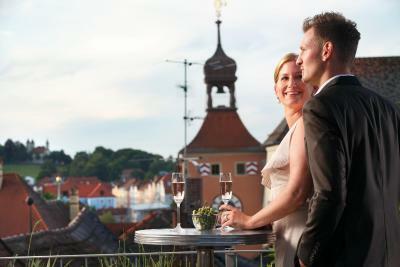 The location is awesome - right in the historic center of Regensburg and an easy walk to everything. Our only regret was that we couldn’t stay longer! The location was ideal. The hotel was new and quite attractive. Great location in the middle of this charming town. Regensburg is worth a visit. Top floor room with great rooftop views. Excellent continental breakfast. The room was big for European standards. Very nicely decorated and a comfortable bed. The hotel was at a great location with lots of resturants to choose from and lots of site seeing within walking distance. I would recommend this hotel and go back to it again in the future. Lovely hotel and well located. The breakfast was great and the rooms were very comfortable. The location is ideal for walking everywhere. The staff were very accommodating and gracious. Outstanding location in the old town but still parking is possible. Nice and clean room, good breakfast. Staff was really friendly and helpful. 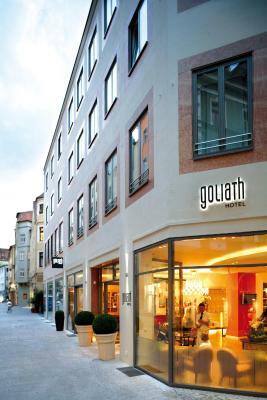 Hotel Goliath am Dom This rating is a reflection of how the property compares to the industry standard when it comes to price, facilities and services available. It's based on a self-evaluation by the property. Use this rating to help choose your stay! 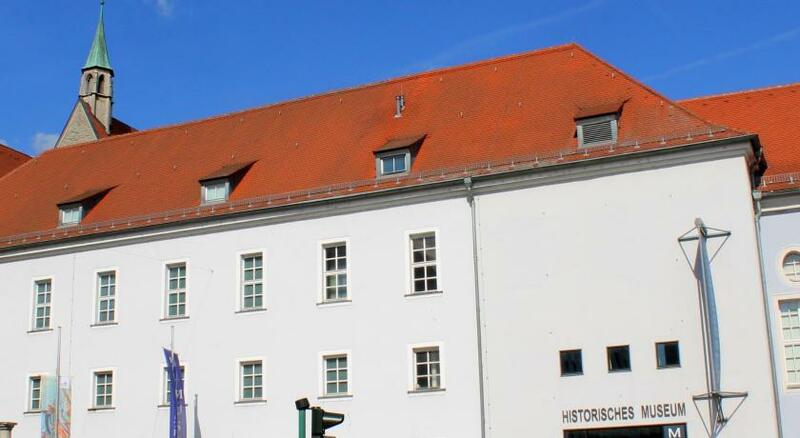 Centrally located in UNESCO-listed central Regensburg, this 4-star hotel offers elegant accommodations next to the historic Regensburger Dom cathedral, the Medieval Steinerne Brücke bridge and the Danube river. 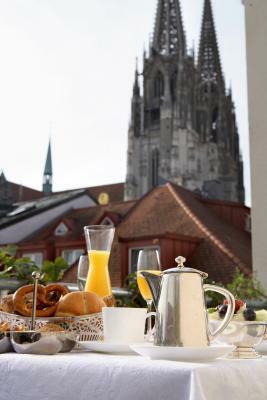 Start your day with the Hotel Goliath am Dom’s delicious breakfast, which can be enjoyed on the Mediterrean-style rooftop terrace in summer months. 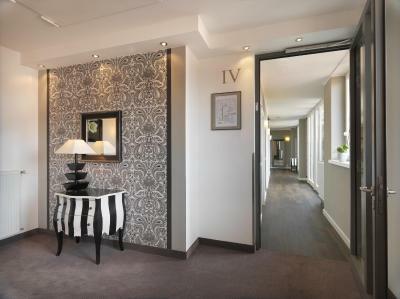 Pamper yourself in the Hotel Goliath am Dom’s sauna area, or enjoy a workout in the modern fitness room. 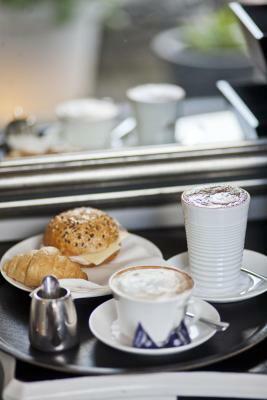 Take some time to unwind in the Goliath am Dom’s cafe, which serves a range of freshly brewed coffees, small snacks and sweet treats. 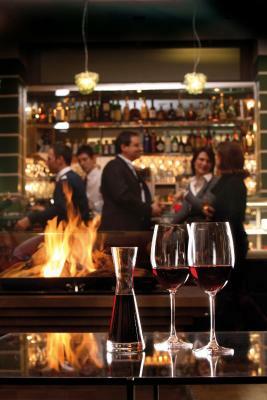 During the evenings, you will find a number of dining options just steps away from the hotel. 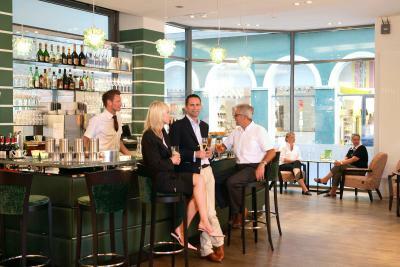 This is our guests' favorite part of Regensburg, according to independent reviews. 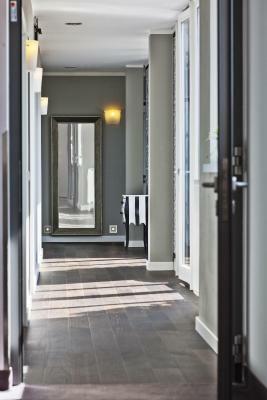 This property also has one of the top-rated locations in Regensburg! Guests are happier about it compared to other properties in the area. 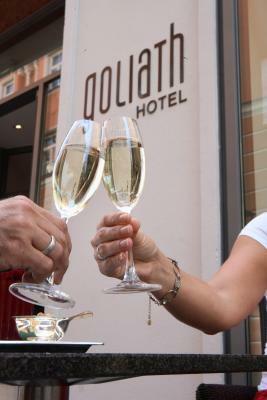 When would you like to stay at Hotel Goliath am Dom? Elegant room with a flat-screen TV, a seating area and a safety deposit box. Public parking is available on site (reservation is not needed) and costs EUR 13 per day. 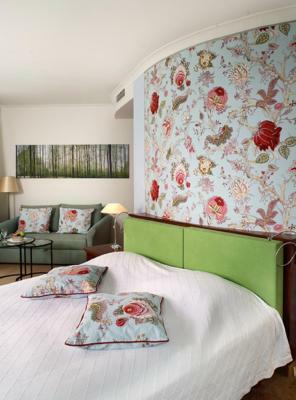 Individually decorated room with a flat-screen TV, a mini-bar and a safety deposit box. 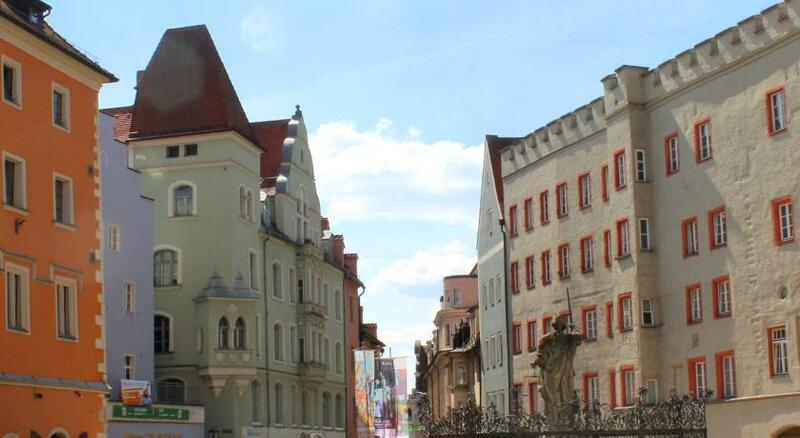 Truly ancient, Regensburg’s old town combines Romanesque and Gothic structures. 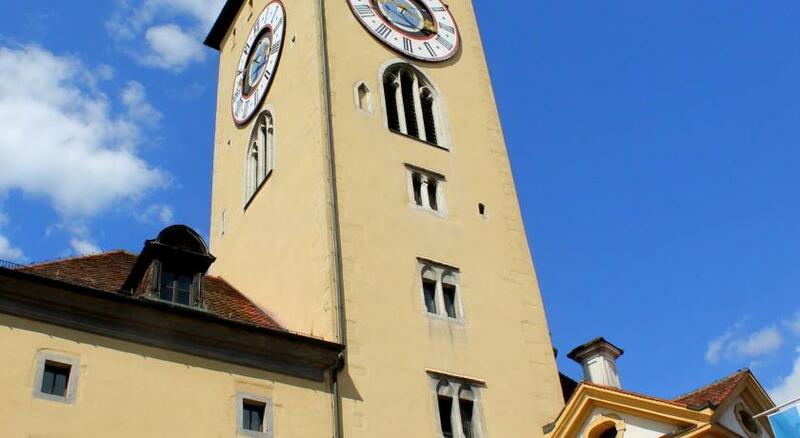 Pass through its charming, narrow streets and explore the market square, town hall, and striking cathedral. House Rules Hotel Goliath am Dom takes special requests – add in the next step! Hotel Goliath am Dom accepts these cards and reserves the right to temporarily hold an amount prior to arrival. Sound insulation, but it is permissible and it will be no problem unless you are very nervous. I should say it is rather good for the hotels located in this covinient but busy location. You cannot always take the both. Great Location. Excellent value. Very professional staff. In this ocassion (we are the regular guest in this hotel for years) we had a small room on the 4th level not with so many space in the room. The bath-room had only a litte window to the room. 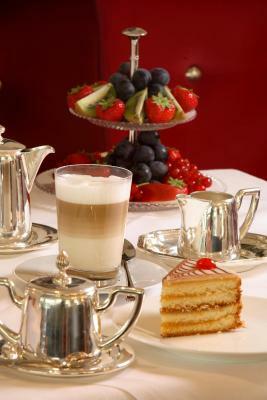 We like the location and the feeling of the hotel and the good and well presented breakfast. Check in receptionist NOT welcoming at all. Expected better service upon check in. The bed was not particularly comfortable: its two twins pushed together, hard and just not the best. Everything else in this hotel outweighs this one inconvenience. The room we've stayed in awoke a feeling of a charming European flat: two large windows that fully open, with window sills that you can sit on and observe the street, which is equally charming. But unlike typical flat in Europe, the room is spacious! Everything was immaculately clean, well designed and useful. Word of caution to the bashful kinds: the shower, while spacious and clean, has a window opened to the living room, the size of standard human torso. No curtain or blinds :). The separate room for the toilet is convenient. I cannot praise this hotel enough for having strong air conditioning! The breakfast was plentiful and sets you right for the day. The staff is friendly and helpful. The location is brilliant: easy walk to Danube river, old bridge, Cathedral is right around the corner. Plenty of restaurants, shops, ice cream parlors, lovely squires and streets. The parking is a bit of a walk away from the hotel and costs 13 euro a night, but its kind of expected in a small historic town. Great location, very clean and great in-room air conditioning.